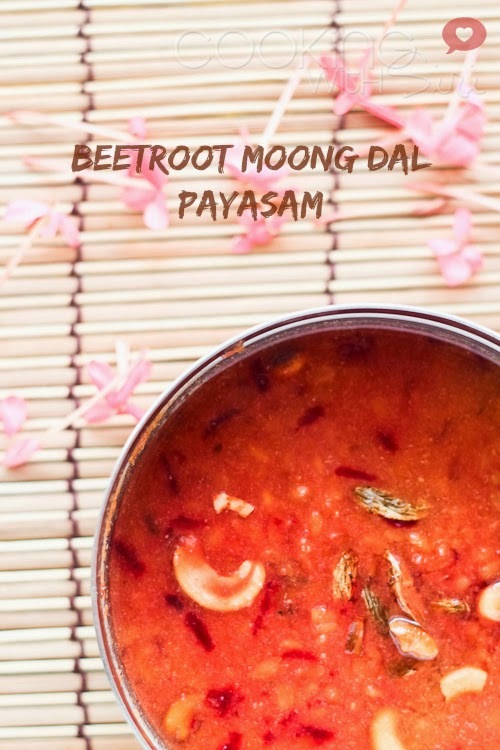 Learn how to make one of the easiest desserts ever - moong dal payasam with grated beetroot. It tastes great when served both as hot or cold. Depending on the season and mood, choose your version.The beetroot juice does add a nice, vibrant color and texture to the usual combination of dal, jaggery and fried nuts/raisins. Today is Ugadi which marks the first day in our Telugu calendar - a time where we welcome a brand new year and aspire all our wishes and dreams come true in coming days. It is interesting to note that the word 'Ugadi' is derived from two Sanskrit words - Yuga + Aadi where yuga is era and adi depicts any new beginning. On this day it is customary to eat Ugadi Pachadi which is made with 6 ingredients for each of the emotions we tend to face in our lives - Neem flowers (Sadness), Jaggery (Happiness), Green Chilli (Anger), Salt (Fear or Apprehension), Tamarind juice (Disgust) and Raw Mango (Surprise). Now, I had 6 emotions to choose from and try to make a dish out of it. I chose jaggery as all I wish for in the coming new year is happiness for all. :-) May there be so much joy in each of our lives that it gives us strength to keep our sorrows and sadness at bay! Today's recipe - Beetroot Moong Dal Payasam is one of the simplest yet yummiest desserts I tend to make on festive days. The addition of beetroot started since past few attempts and once I tasted this version, I never went back making the original one with just moong dal and jaggery. Grated beet gives such nice vibrant color to the payasam and it blends so beautifully with mashed dal and jaggery as well. Enjoy! To all my readers and friends who are celebrating their New Year today, here's Wishing you bestest of times ahead. May all your dreams come true and the year brings you lots of peace and prosperity. A bunch of other Ugadi recipes to try or Browse through the neatly categorized recipe index for more ideas. 1. Heat about 1/4 tsp ghee in a pan and toast moong dal until light golden brown on a low heat. 2. Pressure cook the dal with water for 2 whistles. Let it cool naturally and mash lightly with the back of the laddle. Set aside. 3. In a small bowl, add chopped jaggery and hot water. Stir to dissolve and strain. 4. In a pan, melt rest of the ghee and fry cashews and raisins until they puff up. Strain and set aside. 5. In the same pan, add grated beetroot, cooked dal, milk and jaggery water. Mix well and cook for about 10 to 12 minutes until everything comes together. Finally add cardamom powder, fried cashews and raisins. Serve.